The red pitcher. Natasha Hohonova. 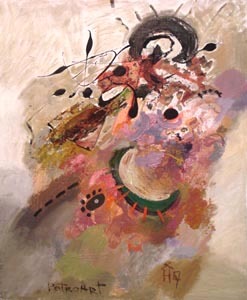 2007, oil painting: oil on canvas, acryl, natural stones (agate), 60x67 cm (23 1/2"x26 1/2"). 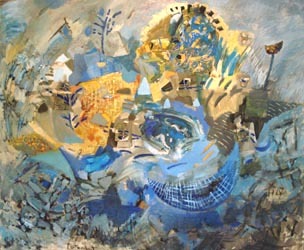 2007, oil painting: oil on canvas, acryl, natural stones (lapis lazuli), 120x100 cm (47 1/4"x39 1/4"). Jasper and orange juice. Natasha Hohonova. 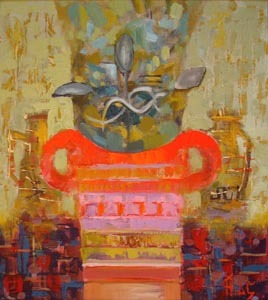 2007, oil painting: oil on canvas, acryl, natural stones (jasper), 50x60 cm (19 3/4"x23 1/2"). View of Fudzi from the Down Sergi. Natasha Hohonova. 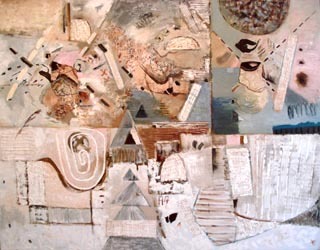 2007, oil painting: oil on canvas, acryl, natural stones (jasper), 140x110 cm (55 "x43 1/4").